A bright red bird observes a blue-eyed glowing light. Where is this light coming from. Does anyone see the eye behind the eye. And to what degree does the other form play a role in this scene. When I look at this photograph, I am imagining a bird to be watching quietly as two friends have a conversation. This photograph is a mystery to me. How is it that there can be so many stories and ideas that can play out in a light and airy space. I really enjoy the colors that are illuminated so softly and the shapes that emerge from the whole. 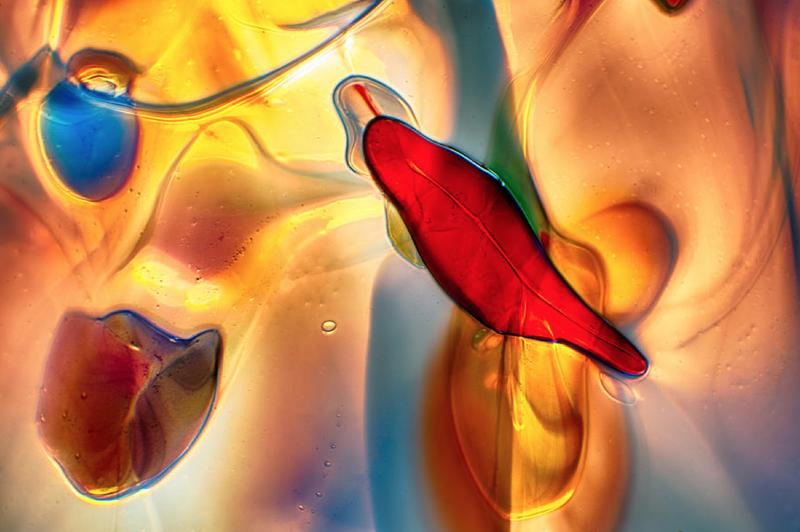 This is a photograph taken during my Macro work with Glass art. This is one of many and I am always surprised at how many things I see in these photographs. I can come back to one that I took a while ago and see new color stories. Colors are telling me stories. My imagination runs wild every now and again….. I love the transparency you have developed in this image. The colours are bold but at the same time soft. There is no doubt that abstract can be a great stimulus to the imagination. We automatically look for recognisable shapes and experience a fascinating journey along the way. This is a very beautiful composition. This is one of my absolute favorites! Wonderful work! Beautiful! You are so poetic in your descriptions! Thank you very much Laura. I enjoy writing about my work. Such a fascinating and colorful image…beautiful! Very beautiful Omaste, I understand what you are about coming back and seeing new things in your glass art. colors are so lovely, Ms multi talent…great job!! Thank you very much. Glass is a really wonderful subject for macro work. Have a great day. Thank you very much for the re-blog Sherri. I am glad you liked my post.